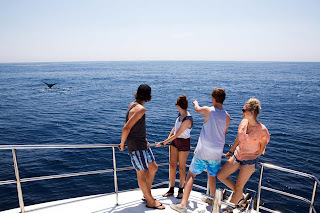 NEWCASTLE WHALE WATCH CRUISE Join the experienced crew on board NOVA Cruises for an unforgettable 2.5 ; 3 hour ocean voyage and experience the amazing migration of over 15,000 Humpback whales. Chance to see huge pods of playful oceanic dolphins, sea birds, seals and much more. Departs Wednesday, Saturday & Sunday @ 10am (June ; Early Nov & every day during School Holidays) Adults $60 ; Concession $55 ; Child (up to 17yrs) $35 Family Special 2 Adults 2 Children (up to 17yrs) $155 Free return stand-by cruise if no whales sighted *Terms and Conditions apply. Informative commentary & free Fact Sheets Complimentary morning or afternoon tea Licensed bar and snack food available INCLUDES BONUS HARBOUR AND OUTER BEACH CRUISE BOOKINGS ESSENTIAL Bookings can be made online or over the phone.